Re: 5-WS Straight Free Wall? $22 for ONE curved wall? Hope Jason sells 'em all. We even know who that is. I didn't even look at the seller! Ha! Good eye! 22.00 + shipping. 3 left at this moment. I think you will be happy with your choice. The river set is a fixed river width (2 inches? 1.5 inches?)... every piece has both banks on it. So if you want something wider you can't do it with the set. The Lake Expansion set lets you set the water tiles and you can make the river whatever width you like. The 5-WS, cavern free standing straight wall, was only released as part of the stretch goal pack for KS2. That pack is now available as the Cavern Assortment pack in the shop. There is only one of that particular piece in each pack. They did make the 5-WCU (curved free standing wall pieces) available as a separate set. (edit: available in the store now). They are more stable and can be set to create a wavy straight wall of sorts. I believe, perhaps someone can confirm, the the resin straight (and curved) walls are 4 inches long. The ones from KS2 are two inch. So the resin ones are larger. As of right now, the Cavern Assortment pack is the only way I know of to get more of those walls... The resin ones were sold as an add-on pack 024-CRD2 - Set of Four Straight Cavernous Walls (Free Standing). I have seen them on eBay, but not in a while. Have you considered using the regular cavern walls with the base turned out? Perhaps Erinthor Mountain pieces or KS2 Elevation Blocks would work? Honestly, this bring up a good idea. 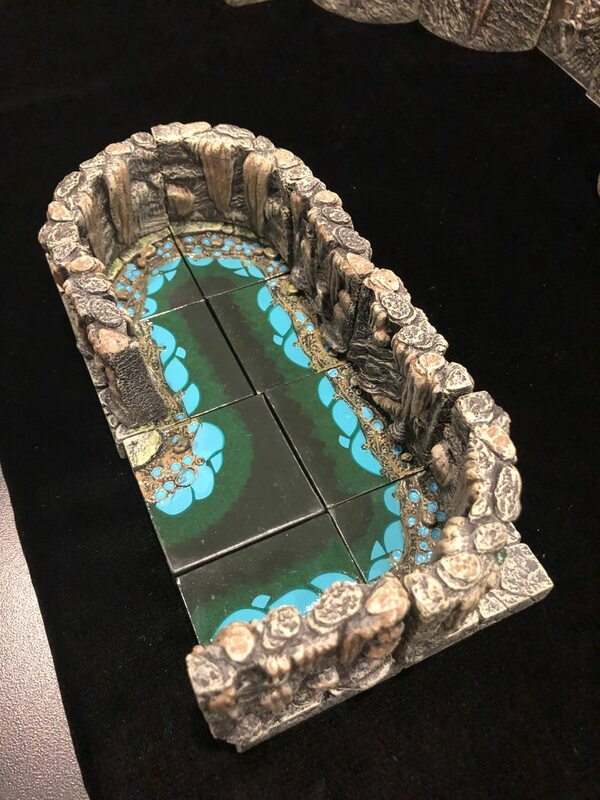 Unfortunately, DF doesn't make the old resin water sets anymore and the walls came with the river set. However, they did produce individual pieces before and had the wall sets you speak of. They also aren't in production. HOWEVER, if the water is such a pain to make, I wonder if DF could still produce the wall sets? There is obvious demand for them. I know they were selling some of their last stock of them at GenCon, but they were $15 per wall. I don't know if they ran out or not. Just looking at the resin Rivers set that came up with the Resin lottery and I tried to recreate that effect but couldn't because I only have 5 5-WS Straight Free Wall pieces. Is there any way to get more of these? I have 5 of the curved ones as well, and I saw they used to sell those but those are OOS. We won 1 ticket so we got the Lake expansion (our first Resin water set) but the River one was very cool and we almost picked that one. In CD I believe it is the Trifecta Straight Wall, which I got 7 coming but could use another 4-6 now to make some river passages.